(CNN) – Sen. Rand Paul sounded less than thrilled Tuesday when a radio interviewer pressed the Kentucky Republican about his association with a former aide, who once used a pro-secessionist "Southern Avenger" persona while hosting a radio show. Jack Hunter, who acted as Paul's new media director and previously helped author a book with the senator, submitted his resignation in July. 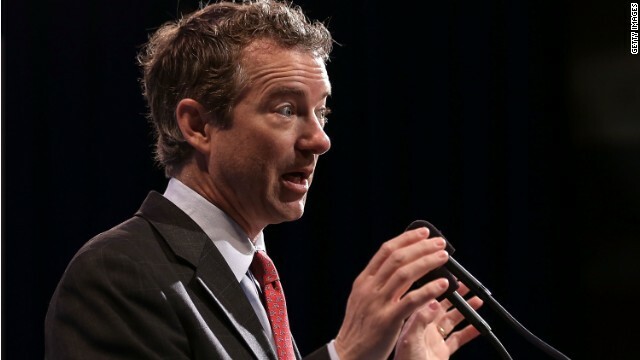 Speaking on the NPR program "On Point," Paul said Hunter had been "unfairly treated by the media and he was put up as target practice for people to say was a racist, and none of that's true." "If you look at his writings, there are a lot of problems and a lot of disagreements, and none of it do I support, but none of it was racist," Paul contended. Hunter had made a number of provocative comments about race and was a member of the pro-Southern independence group League of the South before he started working for Paul. He had previously written articles praising John Wilkes Booth, who assassinated Abraham Lincoln, and acknowledged that he toasts Booth's birthday annually. When interviewer John Harwood began reading an article from "The Economist" about racism within the libertarian movement, Paul cut him off. "Don't you have something better to read than a bunch of crap from people who don't like me?" he asked. "That won't make for much of an interview if I have to sit through reading after recitation of people calling me a racist." "I'm not going to really go through an interview reciting and responding to every yahoo in the world who wants to throw up a canard," he continued. Harwood referred back to the 2010 book, "The Tea Party Goes to Washington," which Hunter helped write. "He's someone who wrote a book with you," Harwood pointed out. Paul, who is considering a bid for the 2016 GOP presidential nomination, has spent much of his trips to early-voting states this year encouraging a more welcoming attitude among Republicans. The Kentucky Republican told a crowd of New Hampshire GOP activists the party needs to "grow bigger." Questions about ex-aides are a distraction from those efforts, he said. "Why don't we talk about Rand Paul, I'm the one doing the interview. You can go ahead and beat up on an ex-employee of mine, but why don't we talk about Rand Paul and what I'm trying to do to grow the party, and then we might have an intelligent discussion," he said. To have an "intelligent discussion" you first need intelligence. I think when that was being handed out poor Rand Paul was missing..